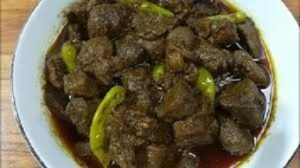 These 3 best beef recipes are the easiest ways of cooking spicy beef and liver that are normally practiced on the Muslims Holy Eid-ul-Adha day. On this day huge numbers of cows are sacrificed in the name of Allah (the God). Most of the solvent facilities sacrifice at least one cow, although up to seven can share one cow. The cows’ meat or beef is also distributed to the one who is not in a position to sacrifice. This way Muslims build brotherhood among themselves. 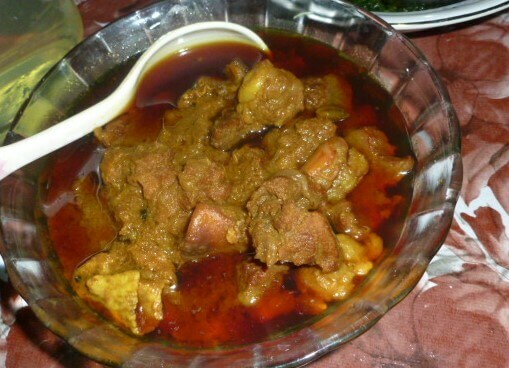 On the Eid day, beef is the main item in the food table of most of the families. Thus, it is desired to cook beef in the fastest way soon after the first batch meat comes home. Normally the fresh beef of young cows does not need a long cooking time. As such, this easy and simple beef curry is cooked in one go without adding any extra water. The meat and all spices are mixed together using hand of the home moms; they sometimes claim the recipe is the magic of their hand. As you get good quantities of beef, you can cook 3-5 kgs in one go. If you expect a number of guests, you can cook even more beef to avoid a second time cooking. Cut the meat into your desired size, wash beef pieces nicely with fresh water. Put on a strainer to drain out water from beef pieces. Mix all spices with beef. Put beef mixed with all spices in the deep cooking pan on the burner. Cover with a lid. You don’t need to add any water if your meat is a young cow. Keep on the burner for another 25-35 minutes with a medium beam. Turn off the burner when oil comes out of the beef. Serve the meat with tortilla or paratha or pulao or rice. I prepare to eat this meat with rice flour tortilla. You can try this recipe with rice flour tortilla. I hope you will enjoy this recipe. Wash and clean beef, and drain out water. Mix all ingredients with the beef. Heat a medium size pan on the burner. Put the beef mixed with all ingredients. Cover with a lid and cook over medium heat until the beef is tendered. Serve the meat with boiled noodles or tortilla or pulao or rice. 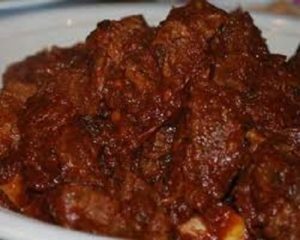 Beef liver bhuna is a very tasty food with lots of food value. This recipe has peculiarity than cooking of the beef items. It is the only cow’s body parts that are not only served with rice, pulao or paratha, but also served as snacks. In many hospitals, liver bhuna is included in the menu of patients as a high protein diet. The beef liver becomes available in most Muslims families after sacrificing cows during the Eid-ul-Adha. It is important to know the process of clearing the blood from the vessels of the liver. There are many ways of doing this, but here in this recipe, the liver is lightly boiled for a quick and easy way of clearing blood. Rest of the other spices is almost common for cooking beef. Cut liver into small pieces and boil it with hot water for 2-3 minutes. So that blood can be removed. Drained out water from liver. Put oil in a pan on the burner with medium heat. Add onion slice and stir the mixture until tender. Add onion paste, garlic paste, ginger paste, turmeric powder, chili powder, coriander powder, cumin powder and salt, stir gently. Add ½ cup water and boil it. Add liver, hot spices and bay leave. Cover with a lid. After drying up water add another ½ cup of water and cook until tender. When oil becomes up, liver bhuna is ready to serve. Serve liver bhuna with tortilla or pulao or rice or paratha. It can be served even without other food items during the tea time in the afternoon or evening. If you like my best beef recipes please share my recipe with your family and friends.